Dogs are people’s best friends, especially when it comes to fun and play time! There are hundreds of alternatives when it comes to their toys, accessories and nowadays even costumes. 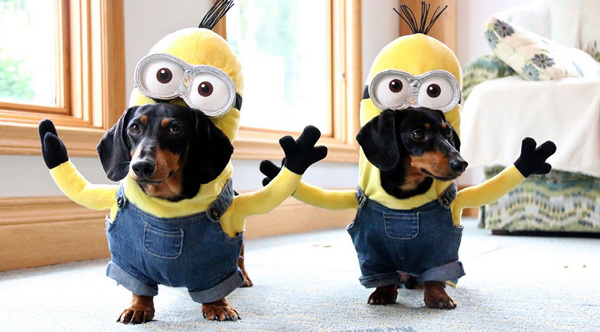 On the other hand, dog costumes might be seen as harmful by some, so choosing one is a hard decision, but we made the section below to help you find the right, comfortable and sought-after costume for your little furry friend. Also, if you want to give your dog a new look, check out our other articles, such as that on dog boots and popular dog vests. Everyone enjoys a cute dog, and this costume might make the little one even cuter! If you enjoy butterflies or you’re passionate about insects, this might be perfect for your four-legged friend. The costume can be found in different sizes (s, m and large). It comes with printed foam wings and a headpiece with antennae. The headpiece is secured beneath the arms, and it transforms the dog into a really adorable butterfly! Also, customers recommend it, but they advise others to consult the measuring chart so they can buy the right size. This costume is going to make your dog look heavenly! All the eyes will be on your pooch, and he will also feel comfortable in his new amazing suit. It comes in four sizes: extra-small, small, medium, and large. Its design is made to give your dog comfort since it comes with a detachable stole, a red and white printed costume and a printed miter headpiece. The materials have a good quality, and the hat has a strap to keep it in place. Customers gave it good reviews and said it is a great option for a Halloween costume or even an Easter party. This is a wonderful costume in all its ways! It has really pretty details, and it assembles a great wonder woman image! It comes with a blue skirt with white stars and a gold belt. Also, there is a Wonder Woman symbol on the red dress and the headpiece. A great bonus is that it is an officially licensed DC Comics pet costume (so it is guaranteed to be authentic) and it comes in six sizes. Furthermore, the customers who wrote reviews are happy with the quality of the fabric, the way it fits on their dogs and how easy it is to dress the dogs! This is the perfect choice for dinosaurs fans and a great idea for a Halloween party. Customers recommend this product because it fits properly on their animals (some tried it even on goats) and it doesn’t bother their pets when they walk. This one is a foam padded costume with great details: spinal plates and a spiky tail. Also, it has a foam printed headpiece, and the bodysuit connects under the stomach. Furthermore, buyers say they like the materials, and there aren’t “enough good things to be said about this costume”. Are you a big Star Wars fan? Well, now you can share your passion with your dog and dress him or her up as a Jedi! A big bonus is that it is an officially licensed Lucas Film Ltd pet costume, so it is guaranteed to be authentic. This one has a cloak with a shirt and belt attached. Customers gave it good reviews (more than fifteen are favorable . They said it is easy to put on the costume, and also that the material is a stretchy polyester blend that is thick and, for a costume, it has nice stitching. We talked about the Wonder Woman costume… but here is an amazing Superman costume out there! 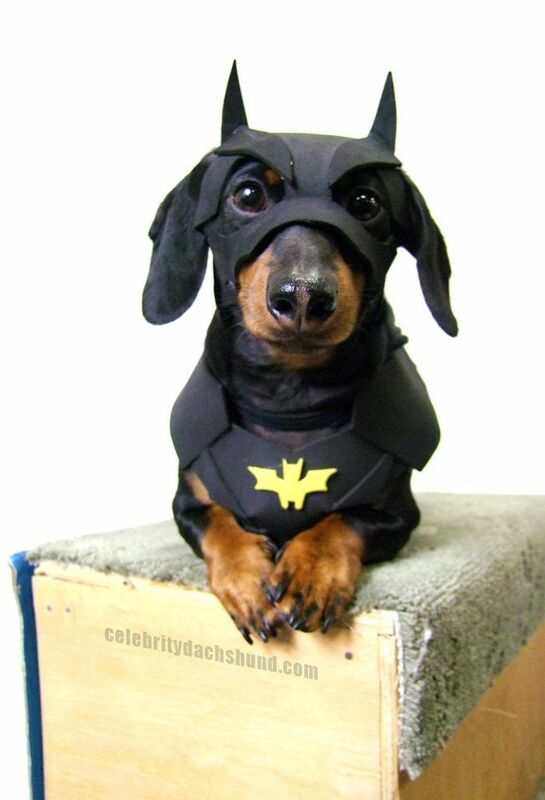 It is an officially licensed DC Comics pet costume, so this is also guaranteed to be authentic. It has a blue shirt with the Superman symbol and a detachable red cape. It comes in four sizes: small, medium, large and X-large. Most reviewers are happy that they could find costumes for bigger dogs and that is easy to adjust to varying sizes as you tie it on. All in all, this is a great choice for Halloween costumes! This one is the perfect costume for a scary Halloween party! It resembles a dog skeleton with glow bones. This fun two-piece dog costume for Halloween features a fitted outfit and matching hat and comes in two sizes: medium and large. Made of easy-care, machine-washable cotton with fitted trim and a stay-dry gentleman’s cut, this costume is said by its customers to be very comfortable for dogs since the cotton fabric gives them enough freedom. Also, it is a fun decision since it glows in the dark. That’s a really great detail! Your pet can now join the fun! This is a perfect costume for parades, parties or just having some fun in a Rainbow poncho and black and gold sombrero headpiece. It comes in four sizes: small, medium, large and X-large. It is recommended for breeds like Pug, Maltese, Jack Russell Terrier, French Bulldog, Boston Terrier and similar size animals. Customers are happy that the costume comes with straps that hold everything together and they say the costume made their pets look “super cute”. Also, some of the animals fell asleep in their costumes, so that’s how comfortable they felt while wearing them. Ever thought about becoming a UPS courier? Well..maybe your dog is willing to. This is a nice costume made from polyester which resembles a canine UPS courier. Some great details are the arms and box attached to the shirt. Also, the hat is a nice touch. Customers said it is a funny choice since most dogs bark at UPS couriers or even try to bite them and this gave them a good laugh. Also, they are very pleased with the fitting and the customer service and their response time. Just like the Mexican Serape before, this Sombrero hat gives your dog the opportunity to have some fun and attend parades or parties. It comes in two sizes: small/medium and medium/large. The multicolor band and trim give your dog a very traditional look. It comes with an elastic strap so it can be kept in place. Also, the small/medium size is suitable for breeds such as Chihuahua, Maltese, Beagle, Boston Terrier, Cocker Spaniel, Pomeranian, Toy Breeds, puppies and the medium/large size for Retrievers, Labradors, Schnauzer, Bulldog, as well as Boxer. Customers said it is a fun thing to wear and they are happy with the way their animals react to it. Provided you’ve started to look for the best dog costumes, you probably already got confused by the very high number of choices that await for you to make your decision. However exciting this is, getting good dog Halloween costumes is not an easy job, and not just because of the extremely high number of dog costumes for sale. With all the good Halloween costumes for tweens and the superhero options out there, either your attention span will make you choose one of the first options you’ll see, or you’ll end up browsing through all the products out there while getting sucked into a black hole of possibilities. Since people have started to include their pets into the most important events in their lives and think of them as more than just animals that are supposed to sit in the backyard, manufacturers have focused on providing animal owners with a plethora of choices that will best suit their animals, as well as their favorite characters. Out of consideration for your time, our specialists have put together a list of the most important things to take into account when looking for cool dog costumes for this Halloween and not only. There are some relevant criteria to take into consideration before making this kind of decision for your animal. From the material the costume is made of, to the color and appropriate character depiction, this is not an easy choice to make. Because you care about your animal so much, here are the most relevant things that should matter when faced with the decision of looking for an appropriate costume. Depending on the size of your dog, you may consider different types of costumes. For instance, if you’re into fantasy or any other kind of literature or movie characters, you may want to start thinking if there’s any animal character from there that you may want to dress your animal into. There are many characters that you may turn your dog into. Whether they depict animals or people from your favorite series or TV shows, you should keep in mind the size of your dog before making any actual decision. If for instance, you like Hulk a lot, but you own a Bichon, maybe this is not the best match, and you should keep looking for a more appropriate idea. However, if you have a St. Bernard or a Cane Corso, this idea would make a very good costume. In any event, you may want to put some thought into the type of character that you want to turn your pet into. Plus, if you own a large dog breed and you wish to make an impression, you could go for a funny character, which will help with the stigma of aggressiveness that is sometimes associated with big animals. This way, you could help your friends and people on the street understand that large animals can be as adorable as the tiny ones, and shouldn’t be associated with fear. When it comes to fabrics, there are two important things to consider. First, there is the weather. You should pay special attention to this one, as you wouldn’t want to dress your animal in a woolen costume on a hot summer day. While you may believe that this is an intuitive point, people don’t always think of the weather before purchasing a costume for their animal. The general meteorological conditions in your country should play an important role in your choice, because you are not purchasing the costume for one day only, and may want to dress your animal into the cool character more than just once a year. From this point of view, considering weather can become relevant, as you wouldn’t want any restrictions because you have not paid enough attention to details. The other highly relevant point when it comes to materials and fabrics consists of the way your dog looks like. And we don’t just mean sizes here, but how long your pet’s hair is. Depending on that, your choice of costume material and fabrics may differ. You should consider getting a thicker costume for a pet with really short hair (such as a Boxer), but you wouldn’t do this for a Husky. Some dog breeds are used to living in unfriendly weather conditions, so their genetic code naturally protects them from cold. If you’re the owner of such an animal and you live in a warm area, maybe you should consider purchasing a costume made of a material that protects your dog from heat, instead of keeping it warm. It is rather important to think of the process of getting your dog dressed in the costume, maybe as relevant as thinking of the costume itself. Some of the popular choices you will find online may make it difficult for you to dress your dog. Now, suppose you want to walk your animal to the park, and you want to dress it in its special costume, you would not like to spend an entire hour getting the animal dressed. Since this would be really time-consuming, you may want to take your experience as a dog owner into account as well. Plus, if the costume is difficult to put on, most likely your animal will not like it either. This way, it will not be just you who will be uncomfortable, but so will your animal the entire time it will wear the costume. To prevent this, you should pay special attention to the way the costume gets put on and taken off so that your dog will associate the entire dressing moment with a game rather than some tiresome punishment. When talking about accessories, it is not the dog that we should keep in mind. Maybe the character that your dog depicts has a sidekick (or is the sidekick) or a partner, and you want to also purchase an extra accessory to wear yourself. At this point, you may want to find an item that will not make you look ridiculous but would paint a nice picture in a subtle way. From the dog leash to a purse or a bandana, there is nothing to stop you from getting creative there.